VISINE® Advanced Relief eye drops combines the redness-relieving power of VISINE® Original with 3 moisturizing ingredients to cool, soothe, and refresh irritated eyes. Think of it as next-level relief after a long stretch of multi-player gaming or binge-watching. Had not used Visine in ages and remembered how it worked wonders for my red eyes so was excited to try this advanced Visine version. What a disappointment, it made my eyes turn even more red! Don’t waste your money. The original was always best although now I’m scared to even try that because there are always changes with products through the years. I also tried the Visine-A for allergies but yet another disappointment, my eyes still teared and itched a bit, didn’t work at all. No more Visine products for me. Hi there, thanks for taking the time to write us a review. We'd never expect something like this to happen, so we'd like to learn more about your experience. When you have a chance, please give us a call at 1-888-734-7648. We're available Monday through Friday 9 AM - 5:30 PM ET. We look forward to hearing from you! Not sure if I have allergies or dry eye syndrome or age related problem. I have tried several products from Walmart brand to Bauch and Lomb and Visine Advanced relief has provided me the most effective relief from burning, itching, watering, tearing, light sensitivity symptoms. 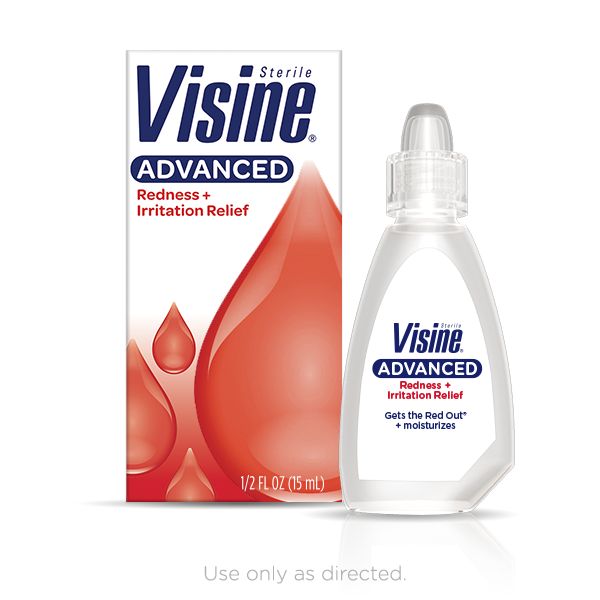 I thought Visine was only to help with redness and I was wrong. Had this product in our medicine cabinet the entire time. Not only did it work best at relieving the symptoms I mentioned, it lasts about 2 days. All other products I have had to repeat use through out the day and its inconvenient to do so at work and especially wearing makeup..Ive downloaded a coupon thankfully found one and going to get more today! Thanks Visine! This product soothes my eyes and removes the redness without any stinging.I am so pleased that I purchased this product. it's a keeper. We're so sorry to hear the product didn't work for you! We wouldn't expect this, so we'd like to learn more. Please give us a call at 1-888-734-7648 from 9AM - 5:30PM ET Monday through Friday. Thank you! It is very soothing and clears redness very quickly! Highly recommend this product! it works like its supposed to work. For that I am grateful.